They’re all fine programs, written by experienced, insightful people who have made fitness their livelihood. Of course, it’s really difficult to say which one is the best. It’s important to remember, though, that the fundamental principles of training your body are the same no matter which program you choose. The results you can get from a certain training program depend much more on your determination than on the program itself. So, you got your gym membership and you want to start working out. The general consensus here is that the first three to six months should be spent on the learning process itself. Don’t expect to get some major gains in the first six months, and this shouldn’t be your goal anyway. Instead, you should strive to learn the proper range of motion, form, breathing and, generally, everything you need to perform an exercise properly. Once you’ve got the technique down, you’re probably ready to move on to heavier weights. A different problem arises now: what should you do with those weights? How many reps, how many sets? The gray zone is a zone of uncertainty, meaning you aren’t sure how to progress further. You want to choose the right program so that you’ll get the best results. Just remember that there really is no perfect weight lifting program, they’re all fine. Therefore, just pick one and get to work. You’ll see some real results as soon as you get out of the gray zone. Four things: squat, deadlift, overhead press, bench press. These four exercises will work all the muscles in your body and they’re often referred to as the basic movements in the world of fitness. 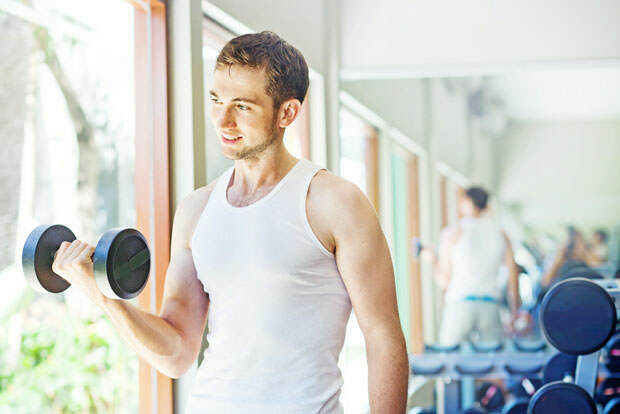 There are more than four, of course, but for simplicity’s sake, stick to these and you’ll be well on your way to success, which means you’ll start seeing excellent results both in the strength and the muscle growth department. Instinctively training your body is something that you’ll be able to do after spending enough time in the gym. This means listening to your body and the signals it sends you, specifically the signals of “pump” and “fatigue.” It’s that feeling of tightness you get when you work your muscles to near failure. From this, you can figure out how many sets and reps are enough for a good, effective workout. When your muscles can no longer “pump,” they’ve done enough and you should move on to a different muscle group.